If we go online, turn on the TV, or read a paper, we find so many reasons to be wary of our fellow man. We are bombarded with stories of crime, terrorism, and hatred and the ratio to good deeds is minuscule in comparison. Then, so many well meaning people continue this parade of the worst of humanity by sharing these stories in conversations or re-posts and forwards. This only perpetuates the idea that we are surrounded by danger. 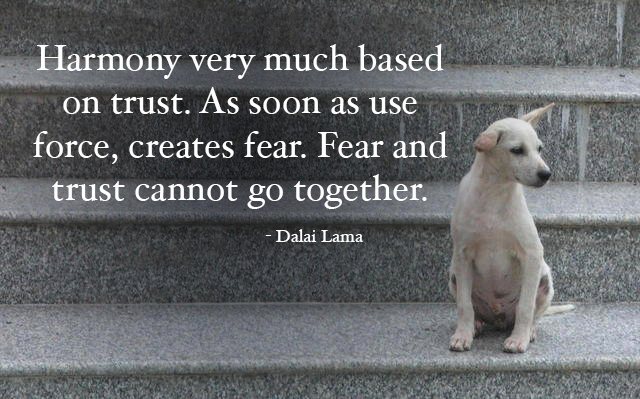 This fear creates distrust of everything and everyone and then kindness stops. We even stop seeing the generosities around us because we are looking for things we should be fearful of. I am not saying there is no evil happening in the world or that we should not be informed of it. I just don’t think we should continue to perpetuate the myth that there is more bad in the world than good. This is just a perception though and the media does a great job of reinforcing the idea that we are more unsafe now than ever before. Yet according to FBI statistics, violent crimes are at their lowest since 1970. We also know that when there is an emergency people show up – in a big way, yet people don’t seem to trust that generosity is there when we are not in the midst of a crisis. Well, I think we should decide that we are in crisis: A crisis of kindness. Let’s start acting like our lives depend on being able to rely on each other – because they do. So what can we do to restore trust in society? We can look for opportunities to trust. The little things are the best and easiest to find. For example, the person holding the door for us, pushing the elevator button or letting us into traffic. (Just this morning, I was carrying two gallons of fresh water and I was offered a ride from a passing golf cart in the RV park where we are staying.) It’s little things like these that make us trust other people are nice and that they are making an effort to be kind. We can also seek out strangers trying to make a difference. Go someplace where people are clearing litter, feeding the hungry, helping animals, etc. We can be more trustworthy. Showing up at those events and activities mentioned above is a great start to let others see that we are willing to pitch in. When we show up we reassure each other that we are not alone. We can offer acts of service – even if they are not accepted or acknowledged. We can hold a door open, we can get that elevator button and we can let someone into traffic. We can then choose to share stories of personal experiences of kindness, given and received – as well as seeking out others tales of the best of people and sharing them. We can never forget that being an example of kindness as well as sharing stories of kindness, opens the doorway to trust. The more these tiny acts are given, observed and shared, the more they will be trusted as normal. People will then be more trusting of others who offer them kindnesses and in turn they will be more willing to offer kindness themselves. We must change the perception that we are innately evil to innately good and we do that one tiny act of kindness at a time. You believe you’re kind. I believe I’m kind. Now we must believe each other is kind.